Alaska U.S. Sen. Lisa Murkowski and two other Republican senators joined all Senate Democrats to vote 52-47 in favor of overturning the Federal Communications Commission’s repeal of net neutrality rules. The Congressional Review Act resolution would simply overturn the FCC’s pending June 11 repeal of existing net neutrality rules. The Obama-era regulations require internet service providers to treat all online content and traffic equally, preventing them from blocking, slowing down or prioritizing certain content. Alaska’s Congressional Delegation has been relatively quiet about net neutrality since the FCC, under Chairman Ajit Pai, voted to undo the regulations. At the time, Murkowski said she would prefer legislation to address the issue, a position she reiterated in a video statement posted after today’s vote. Republicans that joined Murkowski and the Senate Democrats were Maine Sen. Susan Collins and Louisiana Sen. John Kennedy. Alaska U.S. Sen. Dan Sullivan, who once called net neutrality “another outrageous power-grab” by Obama, voted against the resolution. The resolution would still need to pass the solidly Republican House and be signed by President Trump, making it a long shot that the repeal is actually overturned. 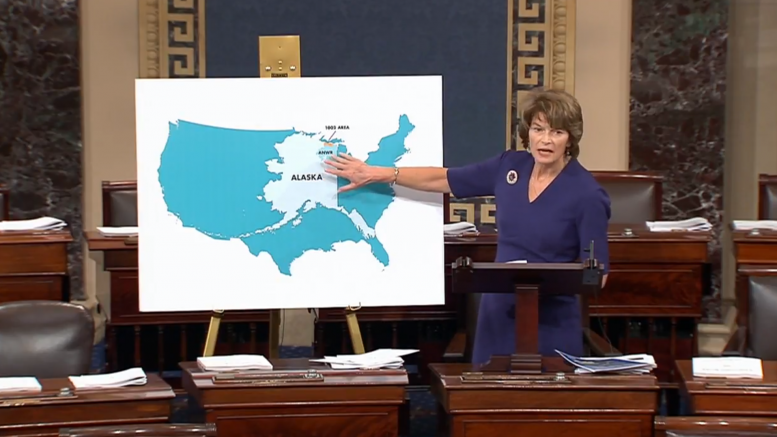 Murkwoski’s statement continued to explain the importance of an open internet to Alaska and explained that she hoped her vote would help keep the door open for new legislation. Fairbanks Rep. Scott Kawasaki, a Democrat, authored legislation that would have instituted a state-based version of net neutrality rules similar to what many other states are considering. Alaska’s two main broadband internet providers, GCI and Alaska Communications, both have publicly pledged to voluntarily follow the tenets of net neutrality. Kawasaki recognized that in his letter, but noted that he was concerned that pressure from larger internet service providers would still harm Alaskans access to the internet. The legislation didn’t make it past the House Finance Committee. Resolutions also calling on the Alaska delegation to support net neutrality were introduced during the recent legislative session, but none were approved. Be the first to comment on "Murkowksi breaks GOP ranks to join 52-47 vote to overturn net neutrality repeal"